Who's up for a little 30th anniversary bash? 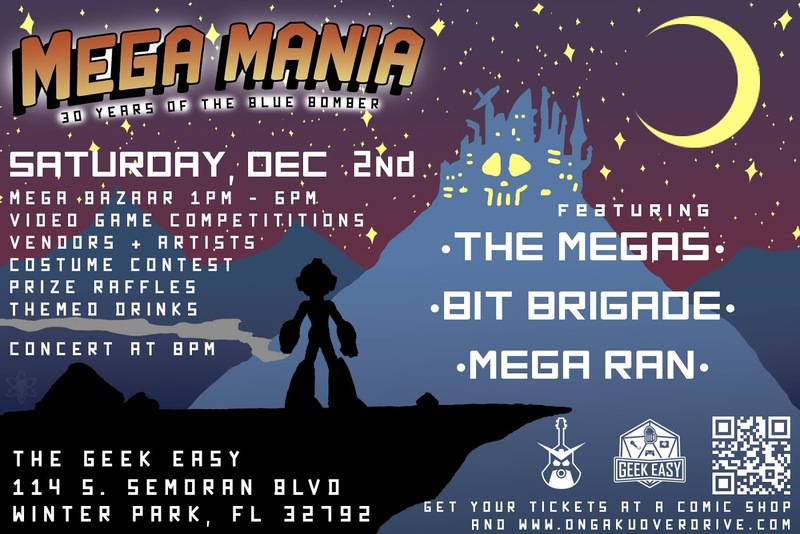 On December 2nd, Ongaku Overdrive will be hosting "Mega Mania: Celebrating 30 Years of the Blue Bomber." The festivity will feature live music from Mega Man-inspired bands and artists The Megas, Bitbrigade and Mega Ran, plus a five-hour "Mega Man bazaar" featuring artists and vendors, playable games, drinks and more. The event will take place at The Geek Easy in Winter Park, Florida. Admission is $15.00 per person. Grab your tickets here! I'm sure it'll be lots of fun and a great way for to meet members of the community. Barring work commitments, I might make the trip. Is Mega Ran going to sing "Mighty"? would have go if i lived in the US.